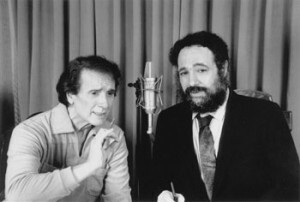 From 1982-94 I hosted the radio program “Opera Fanatic,”on the Columbia University station, WKCR-FM, in New York, where these interviews took place. The March 3, 1990 program originally was nearly five hours and the March 30, 1991 program was three and one half hours. On the March 3, 1990 program, in particular, Franco wanted me to translate questions and statements into Italian. For the DVD and download version I edited out my Italian, with the result that my English flows oddly since the original sentences in many cases were half English and half Italian. Franco and Loretta Corelli left the studio shortly after their on-air squabble during the March 30, 1991 program. I filled the remaining air time with unrelated material, omitted here. The original version of the March 30, 1991 program may be purchased on VHS from Bel Canto Society. The noises heard intermittently during the March 30, 1991 interview leaked into WKCR’s studio from an adjacent auditorium and were picked up by the mikes. There is no way of both eliminating these noises and preserving our discussion. Special thanks to Steve Leopold for providing tapes of both programs. –S.Z. “Opera Fanatic” had over 80 Celebrity Guests. Below are some selected biographies. According to Jerome Hines’s autobiography, This Is My Story, This Is My Song (1968), in 1954, when he was singing Boris at the Met, he concocted a publicity stunt: He would fall at the end, feign injury to the point that he couldn’t get up, be hospitalized–and get a headline. Throughout most of the book Jerry reports what an inner voice, which he believed to be God’s, said to him. According to the book the Lord came to him in a dream and told him that if Jerry pulled the stunt he’d get a headline but the Lord wouldn’t help him anymore. When at length Jerry declared, “All right, that publicity stunt is out,” the Lord said, “I will repay you for this.” The result: the Lord created the Cuban missile crisis and arranged for Jerry to sing at the Bolshoi and receive a message of peace from Khrushchev. (Khrushchev “proposed a toast to ‘peace and friendship between our countries. '”) When Jerry landed at Idlewild (now JFK) he was besieged by reporters and made front-page headlines worldwide. I invited Jerry to tell the story on “Opera Fanatic.” Though he was a religious zealot he said our audience, which was secular, would think him a lunatic, so he begged off. He did have a large religious following that revered him, however, and he gave his own opera, I Am the Way, with himself as Jesus, 93 times. On “Opera Fanatic” he characterized himself as a street fighter and claimed to enjoy our on-air sparring. We ended up doing 12 radio shows together. Also we each sang on an Opera Fanatic’s Gala, at Hunter College’s Kaye Playhouse in 1995. Born Jerome Albert Link Heinz, November 8, 1921, in Hollywood, California, he changed his surname to Hines at the suggestion of manager Sol Hurok, on account of anti-German sentiment. Jerry studied math and chemistry at the University of California at Los Angeles beginning in 1938. He studied voice with Gennaro Curci (Amelita Galli-Curci’s brother-in-law), later with Samuel Margolis and Rocco Pandiscio. Debuting, in 1941, at the San Francisco Opera, as Monterone in Rigoletto, he then sang there as Biterolf in Tannhäuser. He appeared in New Orleans, also with various American orchestras and came to the Met in 1946, where he made his debut as the Sergeant in Boris Godunov. In 1948 he sang the Met premiere of Peter Grimes and, in 1959, that of Macbeth. He appeared with the operas of Rio de Janeiro and Sao Paulo, also at the Colón of Buenos Aires as well as at Edinburgh, where he sang Nick Shadow in The Rake’s Progress, and Glyndebourne. In 1954 he appeared in Munich as Don Giovanni. He also sang in Paris, Vienna, Rome, with the Maggio musicale fiorentino and, in 1958-59, at La Scala. Beginning in 1958 he sang Gurnemanz, Marke and, in 1960–61, Wotan at Bayreuth. Jerry’s career was based at the Met, where he sang 868 performances of 45 roles in 35 operas over 41 years. He was the Grand Inquisitor in the Don Carlo that inaugurated Bing’s reign as General Manager, in 1950, and appeared in a Met telecast of Don Carlo, as the Grand Inquisitor, in 1980. His repertory included Il barbiere di Siviglia and Gounod’s Méphistophélès. He told me that he found Sarastro uncongenially low, yet he performed the part 55 times at the Met, more frequently than anyone else there. He also performed Ramfis more than anyone else there, 104 times. He was bitter that the Met put him out to pasture, in 1987 (his last performance there was as Sparafucile, on January 24 of that year). His favorite part was Boris. In 1952 he married soprano Lucia Evangelista, with whom he fathered four sons. Besides This Is My Story, This Is My Song his books include interviews on vocal technique, Great Singers on Great Singing: A Famous Opera Star Interviews 40 Famous Opera Singers on the Technique of Singing (1982) and a voice manual, The Four Voices of Man (1997). He recorded for RCA (Macbeth and Lohengrin), Decca (La favorita), Columbia (Messiah), CBS (Le Prophète, Bluebeard’s Castle), Cetra (Manon) and is heard on many live-performance recordings. Jerry founded and headed Opera Music Theatre International, to train young singers, in New Jersey. OMTI flourished for a time, in part because of Jerry’s success in obtaining lavish state arts funding. But that success fostered charges that the state was playing favorites and that OMTI had received considerably more than its just share. State support was cut back severely. (A program Jerry and I did on the subject was transcribed by Michael Redmond and published in the Sunday Star-Ledger (Newark, NJ). Jerry was devoted to OMTI, but control was wrested from him, in a putsch by some board members. During Jerry’s last years he took care of his wife, who succumbed to amyotrophic lateral sclerosis (Lou Gehrig’s disease), October 26, 2000. On January 30, 2003 he told me in a phone conversation, “I was greater than Pinza, Siepi, Christoff, Treigle, Neri and Pasero [with all of whom his career overlapped].” He mentioned that he had been suffering from diarrhea for six months and was going into Mt. Sinai Hospital, in Manhattan, the next day for some tests. On February 4 he died there. The Board of Education of the State of New Jersey funded OMTI lavishly during its first two years of existence. We told the state we didn’t want to spend all the money at one time, but they told us we had to or we wouldn’t be given as much the next year. After that, funding dried up. After Henry Lewis, William Vendice and Frank Corsaro had left, Jerry and Lucia gave money out of their own pockets. I stayed on teaching without salary for two years, but when the board did not want to pay even for the accompanists in my lessons, I left. The idea of OMTI was wonderful. I felt terrible about what happened. Lucia had a horrible death. I think Jerry wanted to die after that. The joy of life had left him. They had a wonderful marriage. She didn’t regret having forsaken her career for her family. Students were afraid he’d injure their voices with his mechanistic approach. The Corellis felt Jerry had betrayed Franco, although Jerry and I exhorted them to study with him. But Franco didn’t want to teach at OMTI any more after that. (plus one on RAI, in Italy) and eight more with Jerry–separately. doing a Webcast together with Giangiacomo Guelfi. husbands waited discreetly in the background. Whereas Callas made the world understand that a number of neglected bel canto operas could be exciting for today’s audiences, Sutherland and, even more, Bonynge, propagandized for the presentation of the operas in the manner in which they were first given. Gavazzi and Gencer claim that not only did they themselves employ chest resonance but that the other divasin particular, Olivero, Cigna, Adami Corradetti, Simionato and Barbieridid as well. (Frazzoni made some seemingly inconsistent statements about whether or not she herself used it.) These latter deny having resonated in their chests. I asked Gavazzi to explain this. She claimed they employed chest unknowingly. This kind of explanation is common among singers. Corelli and Hines cannot conceive of any tenor singing above the staff without routinely covering his tone. Yet Alfredo Kraus and I claim we do exactly that. Speaking on the radio program “Opera Fanatic,” Corelli and Hines insisted we cover automatically, without being aware of ita view we reject. Also speaking on “Opera Fanatic,” Kraus asserted that Chris Merritt sings his high notes in falsettoa view he rejects. The dispute over chest voice may be a special case, however. The anti-chest divas were raised in the belief that chest resonance is vocally unhealthy. They also were told it fractures continuity of musical line. Still, certain powerful emotions and coloristic demands sometimes flushed chest out of them. But they hate to admit it. Each diva views her vocal technique as having the sanctity of religion. Each is mortified if the world knows she sinned. Barbieri insisted she wouldn’t attend The Bavarian State Opera’s showing of Opera Fanatic if Gencer were there, on the grounds that Gencer had insulted her by saying in the film that sheBarbieriused chest voice. Why should opera lovers care about whether or not someone sings with chest voice? Because the affective consequences are very great. My viscera aren’t satisfied if chest isn’t used in certain passages, the phrase “un gel mi prende” (Norma), for example. During the interviews it became clear that the divas respond to words and to the music’s emotions but don’t analyze its structure. They never think about clarifying a vocal line by showing through emphasis which notes are melody, which mere ornamentation. The notion of each piece containing a hierarchy of notes is foreign to them. Unlike the majority of singers (Italians in particular), most of the divas in the film turned out to have studied instruments. Perhaps that contributed to their musical intuitions. Simionato had no such background, yet her musicianship was no less expressive. 26th: Bonci, Consiglio, De Lucia, De Muro, Fleta, Koslovsky, Leech, Lemeshev, Mann, Merli, Pears, Peerce, H. Price, Ralf, Schipa, Schreier, Simoneau, Tamagno, Tagliavini, Thill, Wittrisch and Wunderlich 1 vote (0.2%) each.